Lock in a great price for Mama Chelita – rated 8.1 by recent guests! Owner Julio was very attentive and flexible. He let me change my next day breakfast to right when I checked in early in the morning. I booked the flight to see Nazca lines with Julio at a good price. I also joined tours guided by Julio to see the mummies and Palpa lines. It offered me convenience as I'm solo traveller. He is a great tour guide with lots of interesting information in English. I learned a lot about Nazca. Nice breakfast. Flexible breakfast hours cooked by Julio. You can enjoy breakfast even after 11am after your Nazca flight. Julia is very nice. Helped me with a lot of things. He even let me stay until 9:00pm when I supposed to check out at 12:00Am. And you can book many tours at his place with good prices. Really helpful hosts. Allowed me to stay in the dorm until evening on the day of checkout while waiting for my night bus. Excellent breakfast of buns, jam, avocado and melon. Good hot shower. 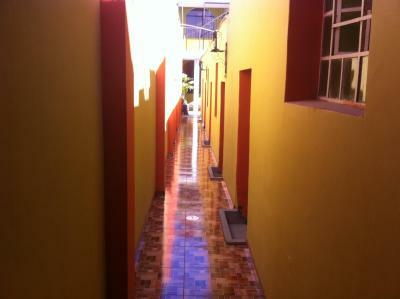 Located close to bus station and Plaza de Armas. The owners are awesome, went way out of their way to hook us up: picked us up from the bus, arranged our flights, and even got us a great deal on a taxi to our next destination. I've never seen a hostel owner take it so far. Plus the breakfast was great. What else do you need? Everything. Julio is the most attentive host. He picked us up from the bus station at no cost, he organised us a flight over the lines with a good deal and the best airline compagny (Air Paracas) with someone bringing us to the airport and bringing us back. The breakfast was good with fresh juice and bread and jam on the lovely terrasse outside, we went on tours with his dad for a good deal too. He allowed us to stay in the room until 10pm to catch our bus which was awesome. Central location on the top of that. Best hostel we have had in Peru, and I never put a 10 before! Thank you Julio for this perfect stay. The managers were just amazing, they helped us and gave us a nice and comfy room. The breakfast is really good and the location to the center is really good as well. We had an amazing experience with my kid since day number one. The breakfast was great and the staff very helpful and friendly! Eduardo even took me to the bus station. One of our best sellers in Nazca! 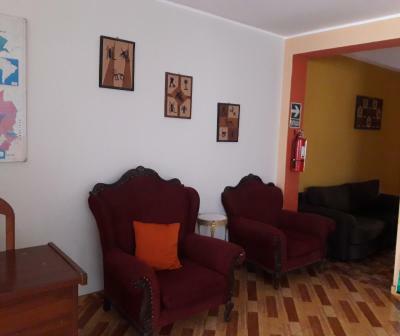 Conveniently located 3 blocks from the main square, Mama Chelita offers accommodations in Nazca. 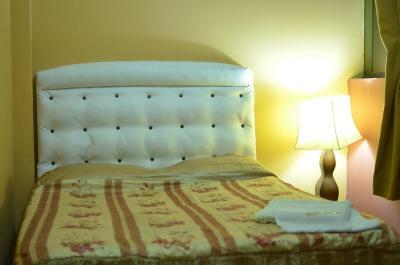 Free WiFi access is available and guests are served a complimentary breakfast daily. Rooms are fitted with a TV, a fan and hot water. You will find a 24-hour front desk at the property. Other facilities include a cozy terrace where breakfast is served. Mama Chelita is located only 5 blocks from the bus terminal. When would you like to stay at Mama Chelita? Public parking is available at a location nearby (reservation is not needed) and costs USD 1.50 per day. House Rules Mama Chelita takes special requests – add in the next step! Please note that check-in and key collection take place at: calle fermin del castillo, nasca 51. Excellent for the price, friendly staff, simple and clean. Breakfast was nice egg, bread, jam, tea and fresh juice. I booked a dorm and got a whole room to myself. I was able to leave my bags at the hostel whilst I did the Nazca and Palpa lines. Extremely friendly staff. They made me feel very welcome. I got picked up from the bus station, they helped me organize my flight over the Nasca lines, and answered any questions I had. The breakfast on the roof terrace was simple but lovely (rolls, scrambled eggs, jam, fresh juice, coffee and tea). And they kept my luggage during the day until my bus in the evening. Building is old, shower and toilet are dirty. I stayed in a dormitory, but other beds after checkout had been left for two days. The owner was kind and friendly, but the tour invited me a lot and felt persistent. Please be aware that there were tour guides with very bad attitude towards ladies on the tour booked at the hostel. Very near from the central and bus terminal. The owner was kind and friendly. I could use the room later the checkout. 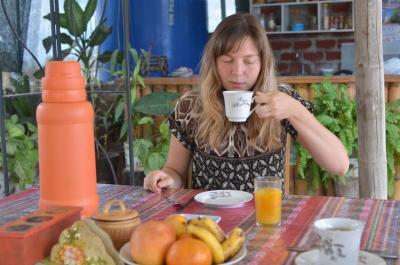 Super nice place to stay in nazca, friendly people, would recommend for sure. Got also offered to pick me from terminal. I arrived at 3 pm but my bed was not ready. I went to the museum, came back around 5 pm - it was still not ready. I could finally get in around 8 pm (according to the description check-in starts from 1 pm). BUT - and this is huge plus - I was allowed to stay in my room until very late (ca. 7:30 pm) and just wait there for my night bus (without any extra charges). Owner is really friendly, breakfast was nice (juice, tea, bread, jam, eggs). They have a kitchen at the terrace - view is nice. It could be better equipped but it's fine. There is no A/C or ventilators in the rooms (at least at mine), so it could be tough during the night. Hostel is in safe neighborhood and within max. 10 min walking distance from all buses and main square. There are few shops and eateries nearby. It's very quiet in the night. It is more guesthouse than a hostel, but since it is so hot in Nasca - everybody still hangs out at the terrace or just outside so you can easily meet other travellers. The property is undergoing renovations and I'm sure it can become a really nice place when completed. At the moment, however, it looks nothing like the photos. My room couldn't be locked on the inside, toilets didn't lock at all, showers were ducktaped together, the mattress was old and shabby. This place was the cheapest I could find in Nazca and I'm still not sure if it was worth the money. The owner was quite nice and could speak English. Breakfast included. The pressure in the shower was not strong enough, but besides that all was great. Very comfortable family-run hotel close to the main square. Free transfer from the bus station is available. The room is clean and nice with an ensuite bathroom and hot shower. Fast wifi. Tasty breakfast served in a beautiful terrace. The owner Julio and his family are just amazing, all very helpful and attentive. 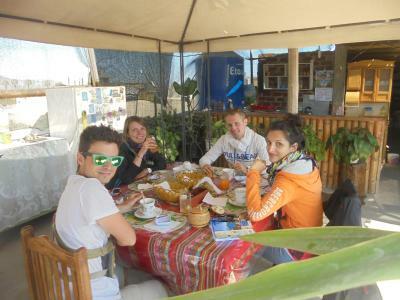 Ask him for some secret tours, if you want to feel the true spirit of Nazca! 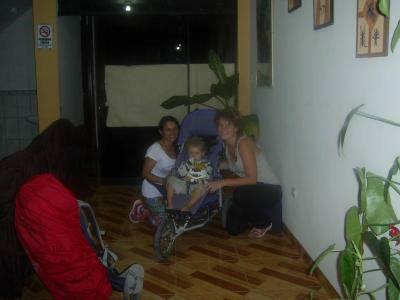 The owner of the Hostal and his father (who showed the Nazca Lines to us) are both very nice and helpful. The Hostal has a roof top terrace and small kittchen to be used by everybody which I enjoyed a lot with my kids. Muchas gracias! Location is not far from main square. Finding the way back to hostel needs GPS because everywhere around looks the same.